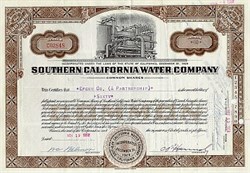 Beautifully engraved Stock Certificate from theSouthern California Water Company issued in 1951 for shares of common stock. This historic Stock certificate has an ornate border with a beautiful vignette of an old water generating plant. The actual certificate is much nicer than the scanned picture below indicates. The certificate is hand signed by the Company's President.